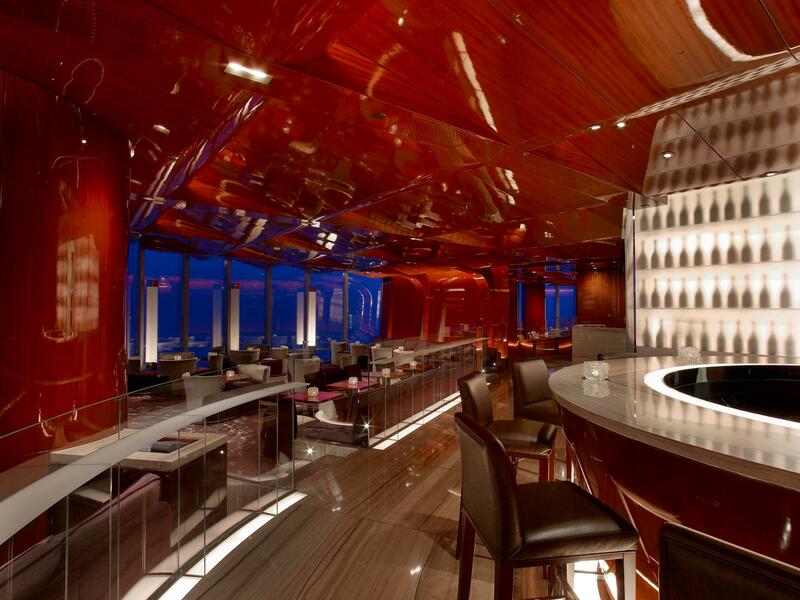 Sip your champagne on the 122nd floor of the Burj Khalifa and revel in the highest views of Dubai. Just opened a few months prior, At.mosphere has already enlivened the eyes of Dubai residents. The name “Atmosphere” refers to the height of the restaurant’s location; it is stationed so high on top the Burj Khalifa that it is, metaphorically, in atmosphere. A visit to this unique and special lounge resulted in gourmet bar food, excellent service, and of course, an outstanding selection of specialty beverages. Venturing into what has always appeared to me as a cold and somewhat overly serious construction, I made my way up somewhat hesitantly. I was familiar with the Armani Hotel but had never been to the Burj Khalifa’s upper lairs. As the chrome steel elevator whisks you up to the only floor on its itinerary, you feel almost as if you were about to take flight into outer space. Upon arrival, you take one flight of stairs down until you are in a large elegant lobby. At.mosphere bar and lounge is to one side while the dining area is located to the other. A classy and sumptuously decorated interior design by renowned hotel designer Adam Tihany features Tihany furniture, mahogany walls and ceilings, hand-tufted carpet and floors of cafe colored limestone. My guest and I enjoyed a glass of Chateau Batailley Grand Cru Bordeaux while we munched on zesty Grilled New Zealand Lamb Chops with Moroccan spices; a rich and creamy cheese fondue; delicately made tomato and buffola mozzarella spring rolls which were an immediate favorite; and indulged in plumped soft Gillardeau Oysters savoring their long lasting deep sea flavor and creamy aftertaste. Pay a visit to At.mosphere on a Thursday or Friday and treat yourself to these oysters with a glass of Laurent Perrier champagne for 200 AED. Already intensely satisfied by our surroundings, knowledgeable staff and delicious bar nibbles, we couldn’t but help ourselves but try two of At.mosphere’s most popular desserts: the luscious Jivara Chocolate Mousse and a tart Blood Orange Souffle. Both were divine. All of this took place while in elevation on the 122nd floor of the world’s tallest building- an impressive recollection for the sheer height of the location. But At.mosphere goes beyond it’s altitude: it is, simply put, on a floor of its own.